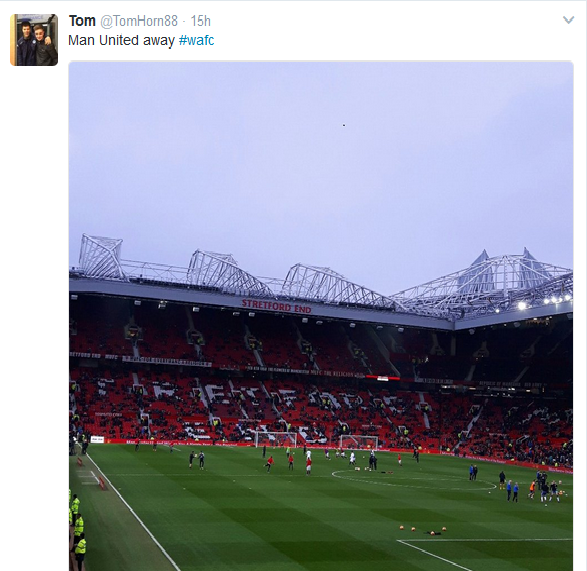 Only the most optimistic of Wigan Athletic fans would have expected their team to get some kind of result at Old Trafford. Damage limitation was the best that most of us had hoped for. But Warren Joyce’s team performed well until Fellaini’s goal in the 44th minute. Latics had at least matched their expensive opponents up to that point and if Michael Jacobs had not fluffed a clear shot on goal they could even have been ahead before the big Belgian bruiser barged past Callum Connolly for that goal. Once behind it was a tall order for a Latics team playing with just one forward. But early in the second half home keeper Romero fluffed a cross straight to David Perkins, one of the outstanding performers up to that point. But sadly Perkins is not known for his goal scoring and could not put the chance away. It was not an easy chance, but it was a lost opportunity to get back in the game. The seemingly inevitable was to follow, as Latics sank under United’s pressure. Joyce had once again put on a cautious line up, loading the midfield. But until Fellaini’s goal they had looked well organised and were holding their own. The defence had been solid and the midfield industrious. Joyce’s influence on the defensive make-up of his teams is clear. He is making Latics a hard team to beat. However, it is on the offensive side where the work still needs doing. As yesterday’s game wore on, Will Grigg looked more and more isolated in the lone centre forward role. Given the team’s lack of goals it is worrying to hear rumours about Yanic Wildschut being sold off. Craig Davies has already left for Scunthorpe and Adam Le Fondre was not even on the bench yesterday. Neither was Jordi Gomez. Some say that Gomez is not a Joyce-type player. 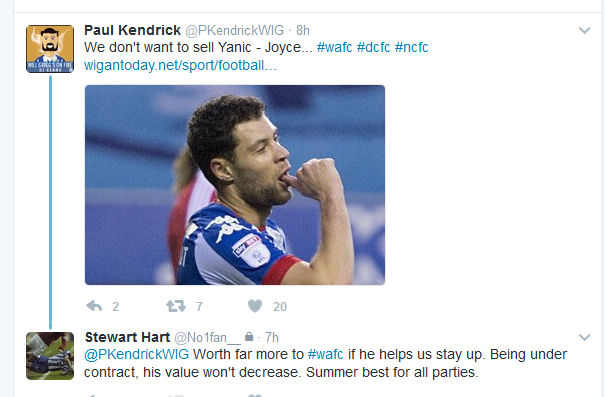 It would therefore be no surprise if he and Le Fondre were to depart in the next couple of days. Yesterday’s Paul Kendrick’s headline read “We don’t want to sell Yanic – Joyce”, with the manager being quoted that: “It’s simple as far as I’m concerned – you don’t want to sell your best players. I’ve come here and I’m trying to build a football club. I don’t think Yanic had played a full game this season before I came to the football club. He’s progressed, he’s lost weight, he’s sharper, he’s fitter.” Rumour suggests that Wildschut will go if Latics are offered between £5-£6 m. The manager clearly does not want to lose one of his key players, but the Chief Executive and Chairman appear to have different ideas. Losing Wildschut would be a hammer blow for a manager trying to keep his team in the division. Some would say that the club could use at least some of the funds to sign a replacement, but Latics will be reluctant to pay a significant transfer fee for a player who will expect a high salary to match. Given that Latics already have more loan players than they can field in a match, the likelihood would be to go for a free agent or a younger player from the lower divisions. All will be revealed in the next couple of days. Great experience today, thought we gave a good account of ourselves despite the result! Thanks for the support. We’ve scored 1 goal at Old Trafford in what 9 goes and that was a last minute Baines penalty in 2006 I think.We were 1 minute away from a perfect 1st half performance.You really didn’t think we were going to go gung ho at them did you – they would have scored a hatful similar to their 3rd if we had. We should have been 1-0 up if Jacobs had connected instead of that air shot in the 1st half. Morsy’s performance showed the class difference between the PL and the Championship. He was fairly anonymous today.That was one of our better performances there and we should be OK for the rest of the season.4th bottom will do at this stage then we can take stock and consolidate ready for next season. If you go to a place like Old Trafford and try to stifle and slow them down eventually you get what you deserve. Totally different match plan from the last three games and left Grigg so isolated on his own. Brought on Yanic for pace but soon after took off the only striker at the club and no further positive options on the bench. Two of the pointless signings had a run out but hopefully we won’t be seeing them again. Let us hope we get back to the style and approach we had for the three wins. Very disappointed today but at the end of the day we were playing the bank but just wish we could have been more positive and not have just put up a brick wall. Could we have lost with a greater score? We were great today. Well done every one. Cracking good atmosphere – in our corner, but blimey how 60,000 can do nothing except a half hearted cheer when a goal goes in ….. is beyond me. No wonder they needed all the help they could get from the ref. Actually with their reputation I was really surprised, I was expecting more. I think it’s open for debate whether the keeper should have come out for the ball. In my eyes, Connolly was too lightweight and allowed Fellaini to outmuscle him. That said, it was a decent defensive performance till the goal, but it was game over when it went in with Joyce’s reluctance to support his lone forward. The cross for Fellaini’s goal came from wide and was very high, in the air a long time and travelled along the six yard box, any decent keeper, especially one that is 6ft 7in would have come for that. The cross was excellent….how can you blame any keeper for being in two minds about that . Outmuscled? I’d hardly calling getting elbowed in the face outmuscled. Since when is that anything other than a foul? Lots of plus points aside from the result. For me the biggest was that we created chances – something we failed to do against very ordinary opposition until quite recently. The players are fitter and working hard. Several players who did not look up to the task earlier in the season are now looking very, very good players. I thought Max Power looked our classiest player today but I’m just in awe of Perks for his ability to break up play and run all day at an age when others are retiring. I liked Gary Caldwell and am grateful for what he did for us but even last season I was never overly convinced of his style of play. For me he erred too much on the side of patience and not enough on the side of urgency. Warren Joyce is beginning to have success at instructing players to look for the forward pass and to have players looking for space between the lines. It provides for more entertaining football I feel and we saw evidence of that today even against the richest club in the world. I’m desperately hoping that we get a new striker in in the next couple of days but I would imagine that whoever it is will only be there providing support to Will Grigg and not necessarily improving the team.